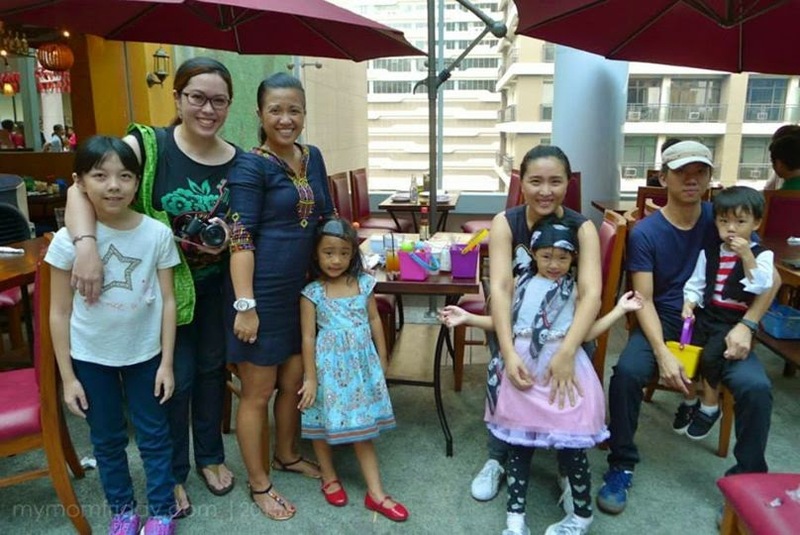 We have always stayed-in in Manila during Holy Week. BOS doesn't like getting stuck in traffic or going to crowded places, in short, he won't enjoy so we always stay in Manila where there is no traffic! 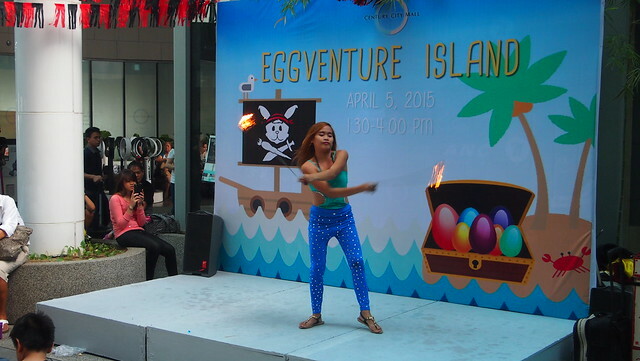 And every Easter Sunday, hotels and malls have all this bonggang Easter events. 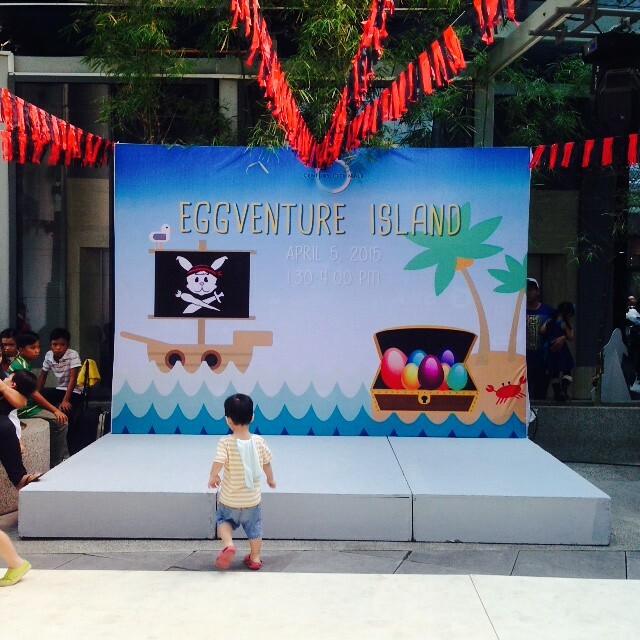 We only started joining the egg hunts last year and this year we joined Century City Mall's Eggventure Island! And I got to be with my mommy friends this year too! 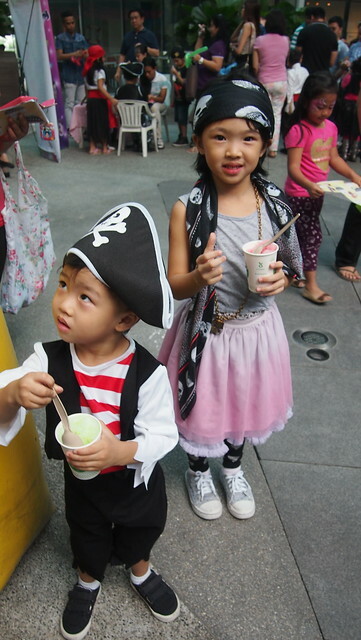 I was so excited to dress my kids up in their pirate costumes! 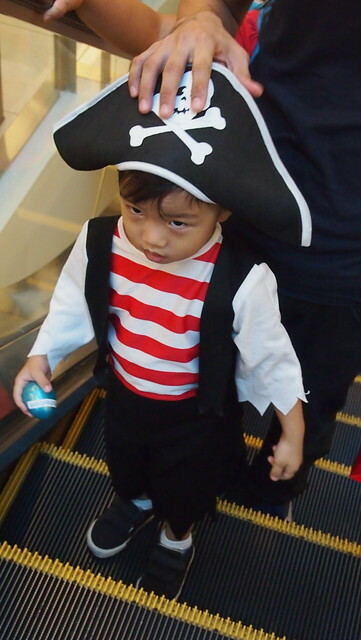 I borrowed R's costume pa from my sister who has a baul of costumes ata hehe! For Y, I just used whatever she had plus my scarf (good thing I used to have a thing for anything with skulls!) and she had an instant costume! Mi pirates! They're so cute! We had lunch at home before going to Century City Mall. We arrived around 1:30PM and there was already a long line at the registration area. 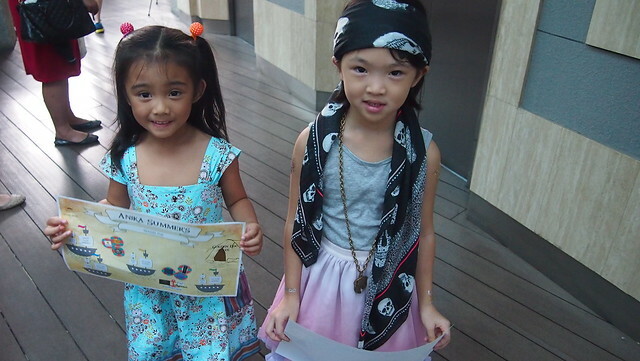 Fortunately, we were able to pre-register and we were able to get our treasure maps and tickets right away! R fell asleep in the car so he joined us with BOS later on during the egg hunt. 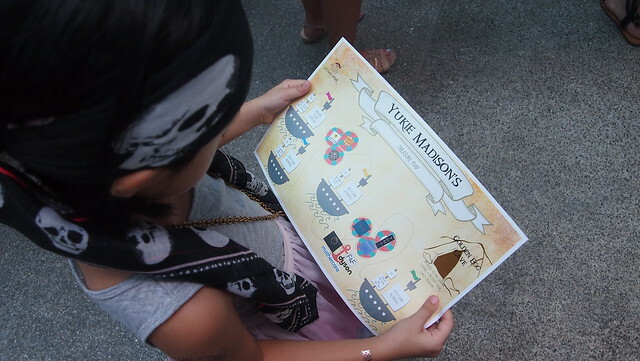 Y checking out the treasure map. I wonder if she understood it. Fleur and I went together with Anika and Y for the egg hunt! 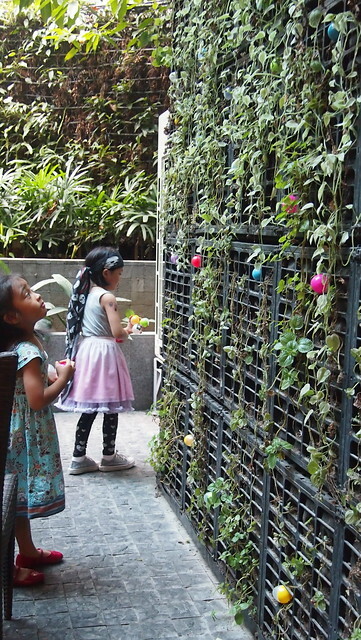 We first went to the 1st floor and there was a lot of eggs at the al fresco dining area! Then we worked our way up to the Golden Cave area which I think was the wrong strategy hahaha! When we got to the Golden Cave, the golden eggs were all gone na! 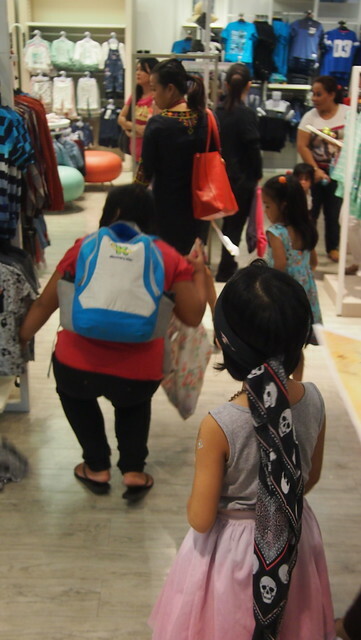 But it was okay, the kids had fun looking for eggs, feeling nila gold lahat ng nakuha nila! Heehee! Anika and Y while waiting for the elevator! Picture muna! Left: They're so happy with all the eggs they were seeing! 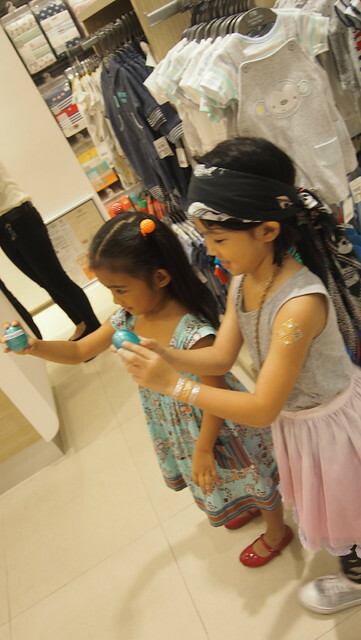 Right: At F&F looking for eggs! 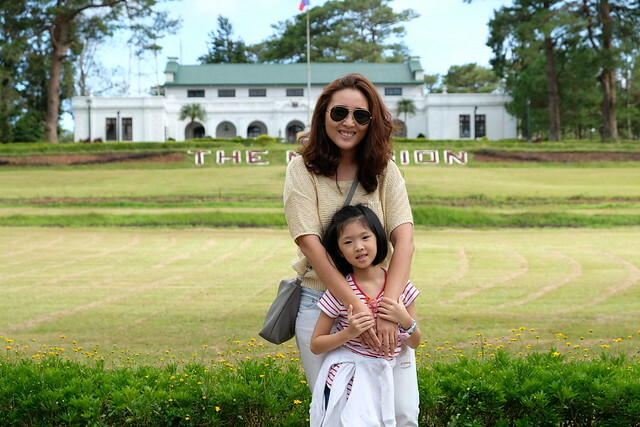 Pati si yaya was helping us look for eggs. At Mothercare, showing off their Mothercare eggs! R finally joined us! He loved his "pi-wate" costume by the way. He didn't want to take it off even when we're home already! 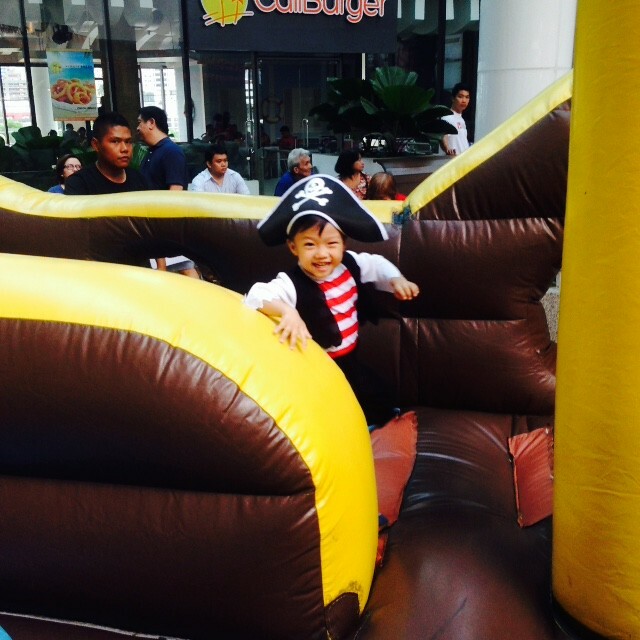 After hunting for eggs, we went back to the activity area to catch the Pirate Show. 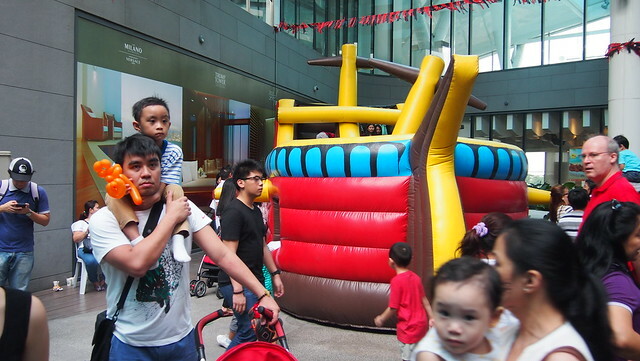 My kids just wanted to stay at the bouncing pirate ship! 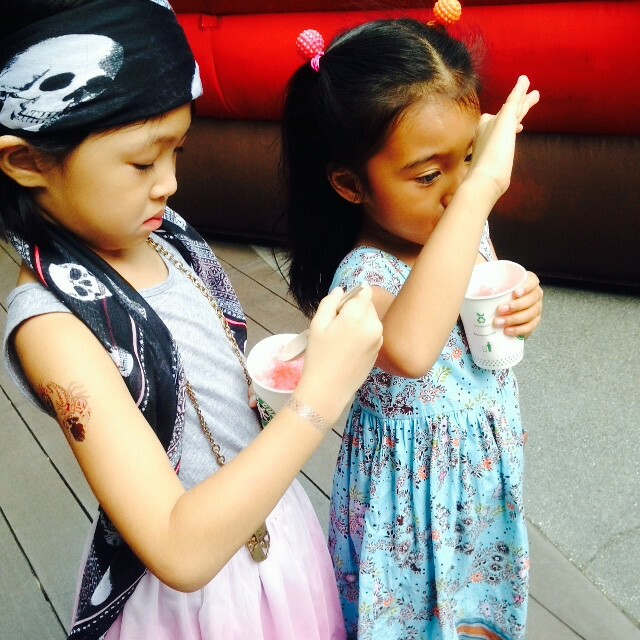 We had snowcones to cool us down while waiting for the kids. 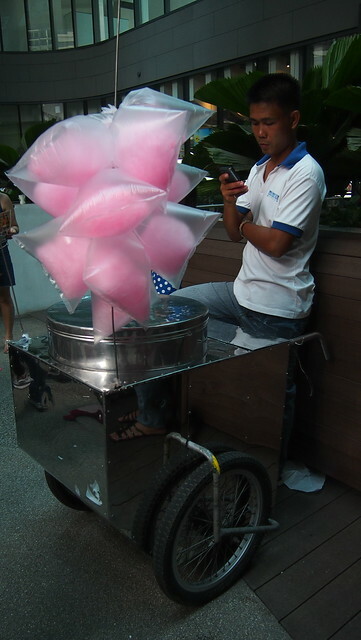 There were other booths too like popcorn, cotton candy, face painting, and balloon twisting. 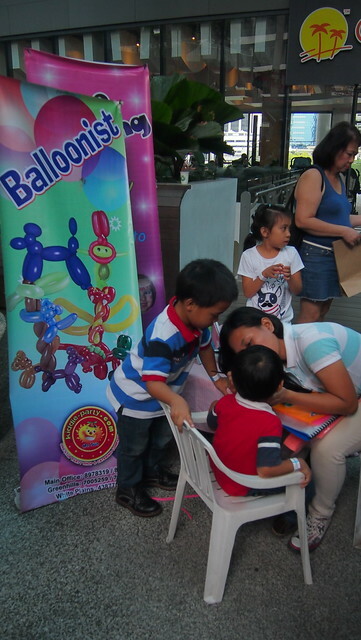 But we didn't line up for the face painting and balloon twisting anymore because the line was so long! 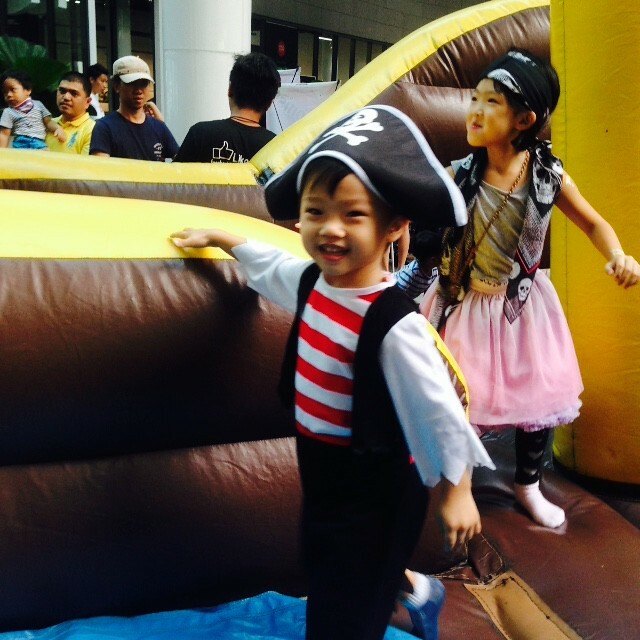 This pirate didn't want to leave his pirate ship. Heehee! 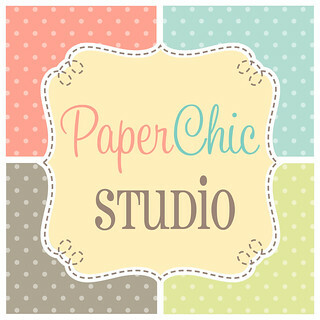 Face Painting, Cotton Candy Booth and more! Time for the magic show! 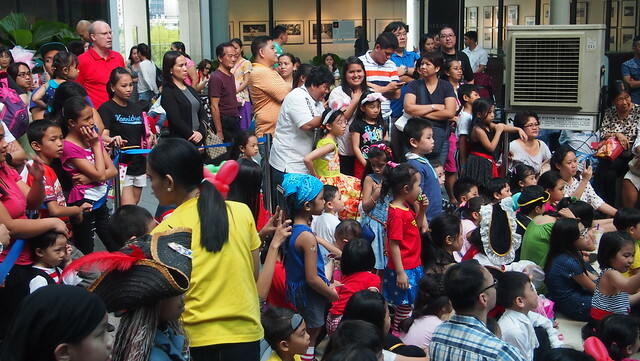 Ang daming kids!!! 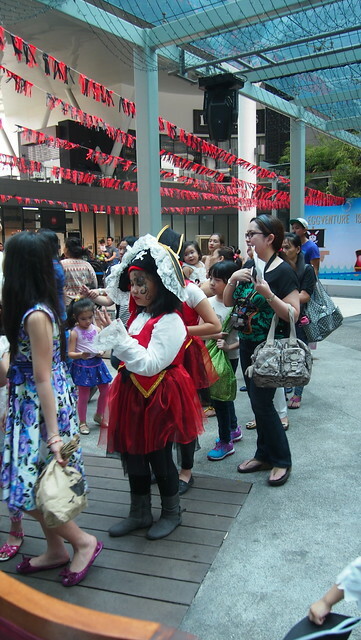 Everyone was engrossed with the pirate show! 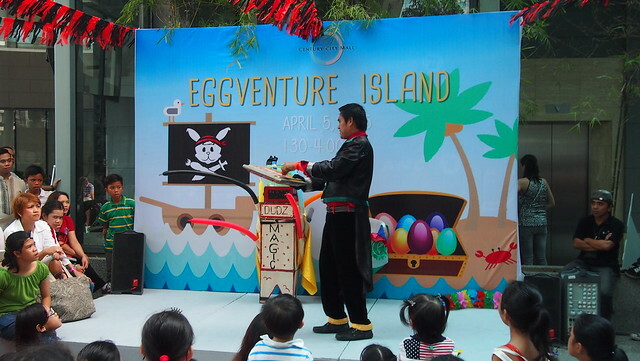 And finally, after the Pirate Show, it was time to claim our prizes from the egg hunt! For the unmarked eggs, we got candies! 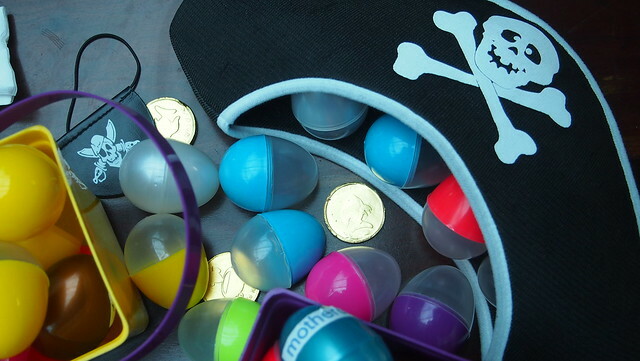 For the eggs with brand names, we got tokens and GCs! Yay! Happy with all the eggs she got! 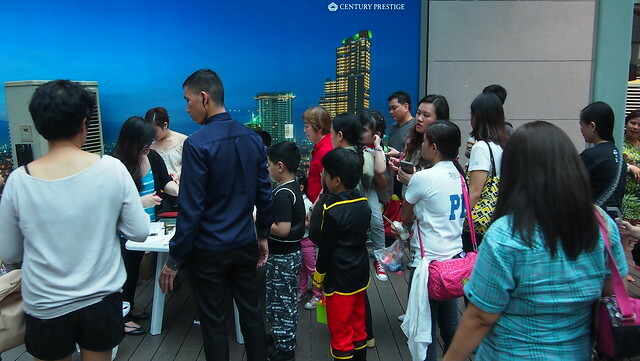 Lining up to claim our prizes! It was a crazy event! Some got mad because didn't get to do the egg hunt the first round because some were still lined up at the registration when the egg hunt started. Hoping for a more organized event next year! Easter Sunday well spent with friends! Grabbed this photo from Michelle. 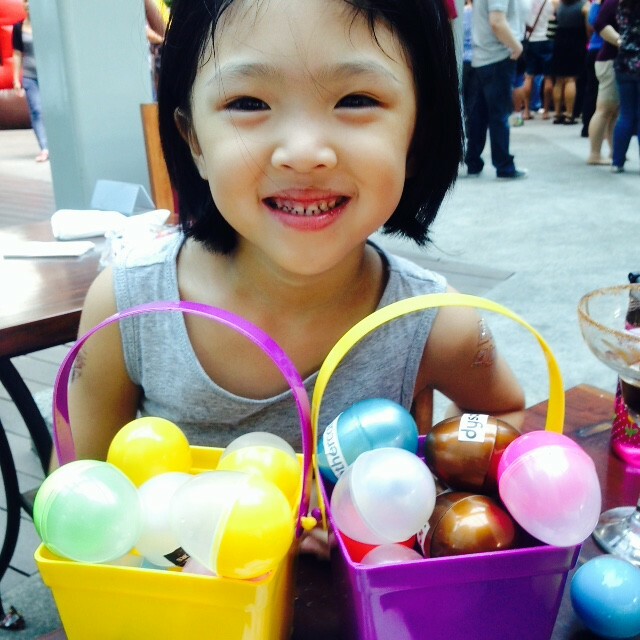 Thank you Century City Mall for the egg-citing Easter Eggventure!